Going away to college is a rite of passage. 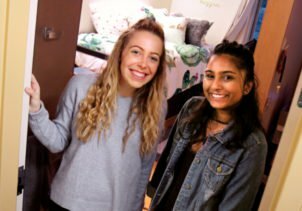 For roommates Anna Holdosh ’21 and Priya Ganesh ’21, move-in day was as nerve-racking as it was exciting. Fortunately, they have one big thing in common—they are both students in the College of Engineering and Computer Science. Their pairing was no coincidence. Syracuse University provides students with the option to live in formal learning communities where students who share a major or college have special access to academic and social resources that are specific to their programs of study. On top of worries about being away from home for the first time, Holdosh and Ganesh shared concerns about their programs. After all, engineering and computer science disciplines are notoriously challenging. The rigorous curricula can feel overwhelming, especially when students are also undergoing a major life transition. Living in the Engineering & Computer Science Learning Community in Shaw Hall quickly put these concerns to rest. Holdosh and Ganesh found that by living alongside students who are feeling the same pressures, a special bond is quickly forged. The camaraderie among students (or “instant friends” as Holdosh puts it) is just one of many great perks of living there. In addition to the wide range of attractive features offered in SU residence halls, the learning community provides students with many direct links to the staff and faculty in the College of Engineering and Computer Science. “We bring the resources from their classrooms to their living space,” says Kirby Gibson, residence director of Shaw and Lyons halls. Presentations by professors, peer-facilitated academic excellence workshops and engineering and computer science themed programming all take place in-house. Students have access to “team rooms” with white boards and flat panel televisions they can display their work on. And computer lounges that feature all of the computer programs engineering and computer science students require are accessible 24/7. Shaw’s staff even coordinates trips that are free of charge to residents, like a recent trip to Niagara Falls, to see the Niagara Power Vista and ride the Maid of the Mist.